Mexico is known for housing some of the most popular beaches of the world. To know more about the best or the top Mexican beaches, read on. Mexico is known for its vibrant and hip lifestyle. It is also one of the most popular tourist destinations in the world. Apart from the spicy Mexican cuisine, the state is known for its buzzing pristine beaches. One of the major attractions for the tourists coming to Mexico comprises of the beaches, where they can splurge and relax. Once the rest period is over, visitors can also enjoy the sassy activities on the beaches, which are dotted with fine restaurants, night clubs and bars. For this reason, Mexico is even said to house some of the most popular beaches in the world. Given below is a list of the top Mexican beaches. Acapulco is a lovely beach in Mexico, which is also referred to as the ‘Pearly of the Pacific’. The beach provides ample opportunity to relax in the day and enjoy the sassy nightlife, during the shady hours. Boasting of comfort, there are a number of plush resorts lined at the beach, which provide accommodation to the visitors. The beach is popular for its groovy night clubs, which offer their best during early morning hours. Cancun is the most popular beach in Mexico, which is frequented by visitors in great numbers. In effect, it is dotted by many resorts, bars, restaurants and night clubs. It is the best place to enjoy a relaxing vacation, amidst fine weather. Tourists can enjoy both quiet moments as well as action, as per their own interest and desire. 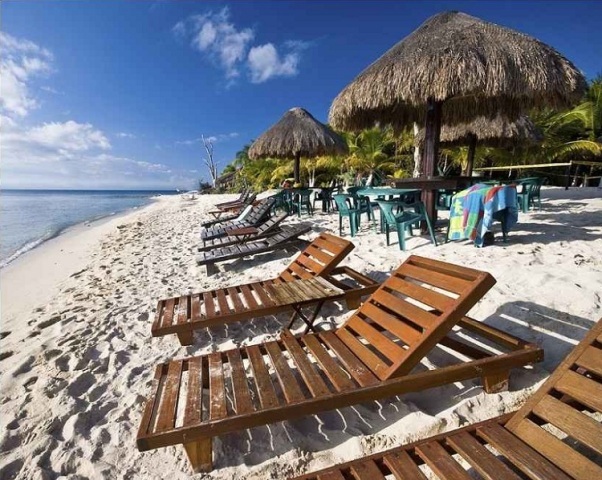 Cancun beach is also apt for foreigners as most of the people in this area speak English. Cabo San Lucas is yet another peppy beach in Mexico. It is located at the far tip of Baja Peninsula, also known as the ‘Gulf of Mexico’. The region is a real paradise, offering natural reserves at its best. The sea water exudes various shades of blue and green, luring everyone. Diving is one of the favorite sports here. Tourists can enjoy water sports, play golf or relax on the sand. Tulum Beach, located on the Caribbean coast, is one of the prettiest beaches in the world. Adding majesty and splendor to its beauty are the picturesque Mayan ruins, overlooking the beach. It is a tiny, but perfectly-formed white sandy cove, featuring palm shade and azure Caribbean waters. There are many souvenir shops, café and restaurants located here, along with a few hotels & restaurants. San Jose del Cabo is also located on Mexico Baja Peninsula. It has a very relaxed and laid back atmosphere, which is ideal to chill out and relax. The natural ecology, landscape and climate of the place make it an ideal spot for tourists. It is indeed a natural paradise, where activities like fishing, kayaking, sailing, camping, surfing, horse riding, nature walks, bird watching, cliff hiking, sunset cruises, pottery and watching whales and sea lions can be enjoyed. Playa del Carmen is yet another place where tranquility and splurging on the beach is a way of life. The area is ideally located, as it also houses some archeological sites to amuse the visitors. Apart from this, quiet sun baths and lazy strolls over the white sandy beaches, with cool water of the Caribbean splashing the shore, are the specialty of the place. Moreover, one can enjoy water spots and swimming with dolphins here. Puerto Vallarta offers some stunning beaches, which are ideal for swimming. Most of the beaches here are secluded and can be reached by boats and cruises. The place can undoubtedly be called a water lover’s paradise, with ample of water sport activities to be tried. Besides, you can indulge in the unusual sport of whale watching as well.